When something is considered “Worth its salt,” it is thought to be worth what you paid for it. Both literally and figuratively today (7/14/13), we got to experience a number of places that were definitely worth their salt. 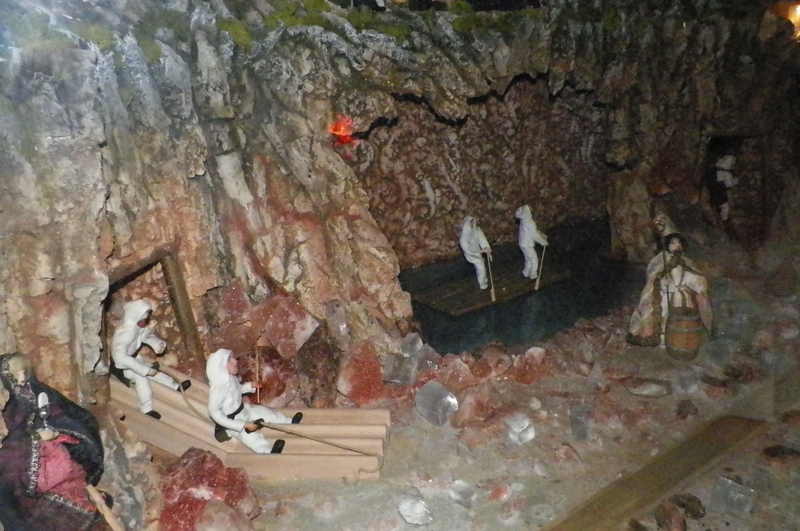 We got a bit of a late start this morning (had to change out our refrigerator in the room), but we got it fixed and headed out to the Salzwelten Hallein Salt mine. This salt mine advertises itself to be the oldest salt mine in the world–that allows visitors. I didn’t know quite what to expect, but it was actually a fun experience. We had a discount through our Salzburg Card, so we got tickets for about $15.00 a piece. We had dressed in warmer clothes and clothes we could get dirty, but needn’t have bothered because the salt mine provided us with what looked like white scrubs to put on over our clothes. All suited up, we then began our tour. The tour started off with a “shuttle” (more of a long pole you straddle behind everyone else doing the same) to one of the caverns in the mine. We watched a movie that set up the importance of salt (Unlike us, when something wasn’t cold, they couldn’t just get a new refrigerator. Salt was what kept their food preserved.) Then, we took a boat across a brine lake (we got to sample the brine as well). That was a really neat experience. 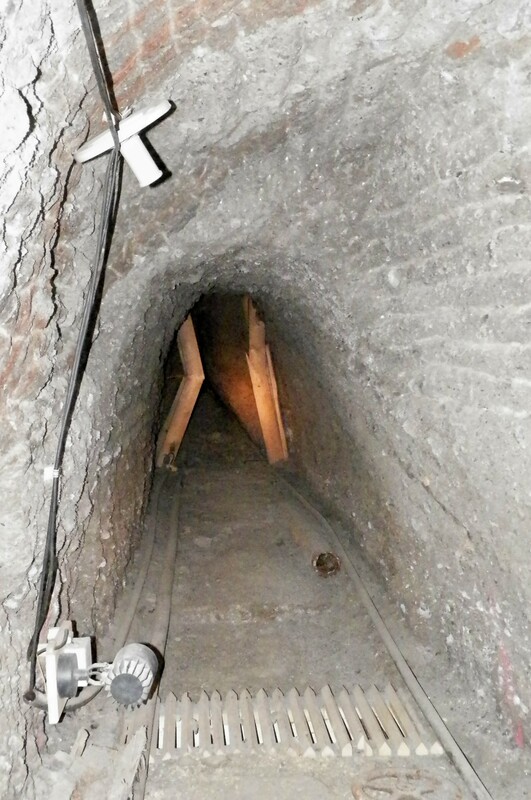 Then, we saw the tools and tunnels used by the Celts and others who mined in this mine. One of the most fascinating experiences (which we decided to forego) was a “slide” modeled after the way miners used to get around the mines. Once again, it was essentially a wooden pole (about 6 inches wide) you straddled, lifted your feet, leaned back, and went down 2-3 at a time. Mom and I decided to take the stairs, since neither of us really enjoy going down long distances at a pace you can’t control, but for those who DO enjoy that, I’m sure it would be a lot of fun. We finished the tour with a view of a man they had found mummified in the salt. It was definitely interesting–and we got a free little salt shaker sample to boot. Just outside of the mine is a Celtic Museum. It’s not THE Celtic Museum–we hope to visit that later this week–and we can get in free because of our ticket to the Salt mine tour. 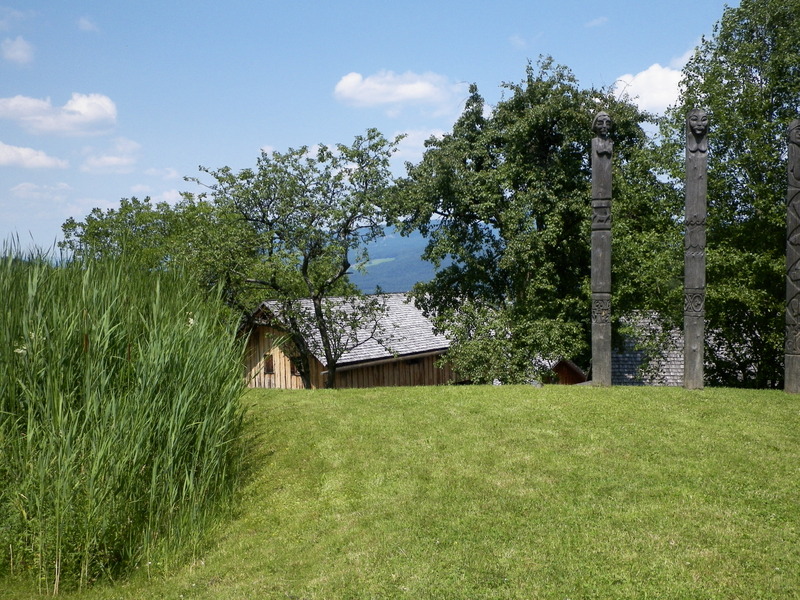 This Celtic Museum was a little village of about 6 houses which explained how the Celts in this area lived. It reminded me a lot of Jamestown in America–similar housing arrangements and styles. It was a neat place to look around as well. On the way back to Salzburg to get ready for our evening show, we again passed the house that’s used as the front of the Von Trapp house, but once again, it was a road over, and we couldn’t find the road we wanted. Alas, maybe we’ll try again. We arrived in Salzburg about 4 hours before our “Sound of Salzburg” show. We had planned to do this show while we were still staying in Salzburg and could just take the bus, but the show wasn’t playing while we were still in town. So we had to park in paid parking to the tune of $18 Euros for the day–reminded me of Chicago parking! A friend had recommended we take the park and ride ($5 Euros/day), but we didn’t know the bus system well enough and didn’t want to try to find our way back to our car at 10:00 P.M. after the show. After locating the building we would be meeting in, we proceeded to continue our tour of Salzburg while we waited. We decided to look inside St. Peter’s Cathedral and Salzburg Cathedral while we were waiting, and it was an excellent choice. These two cathedrals were equally breathtaking. 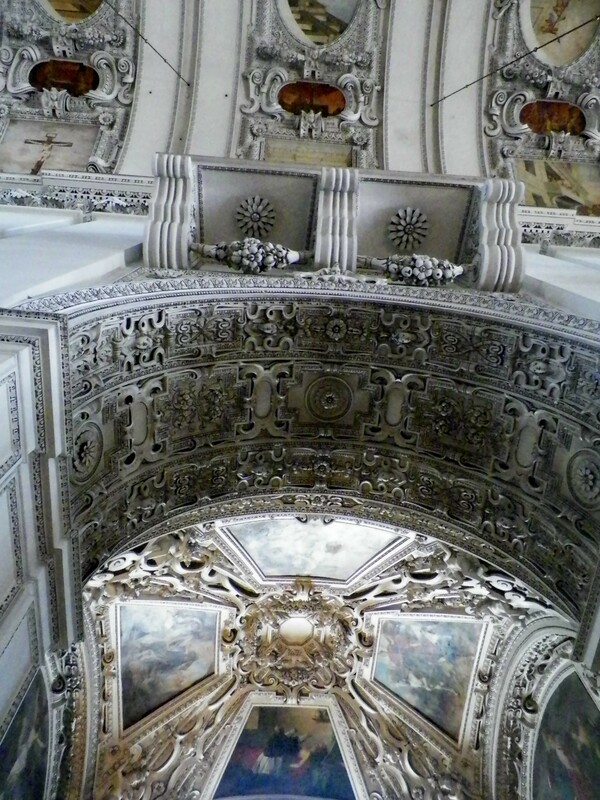 There’s such an artistry in the architecture of old cathedrals that I dearly love. It just saddens me that we don’t have that kind of artistry today–I don’t mean we don’t have artists. We do; and some are incredible. 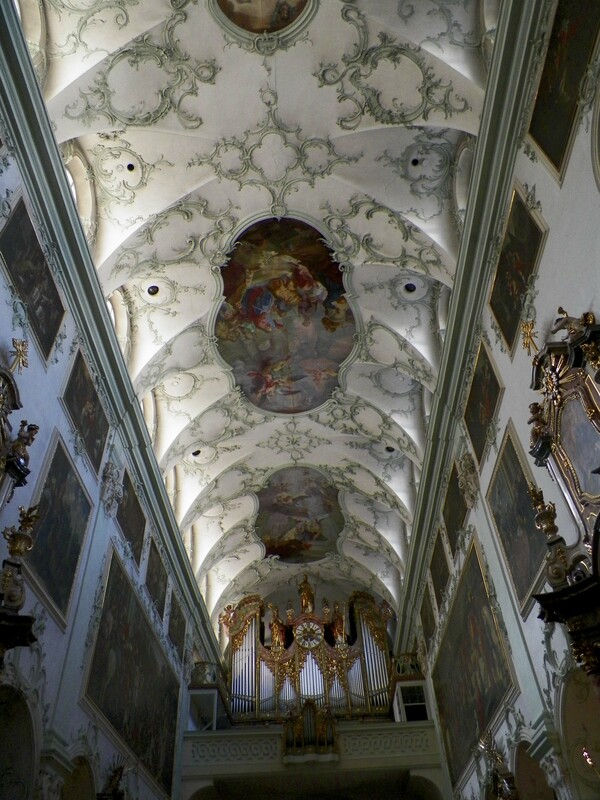 What I mean is that we don’t have the kind of artistry that takes a group of artists between 15 and 31 years like parts of the Salzburg Cathedral did. Thirty-one years on one project! I can’t imagine. Not only is Salzburg Cathedral gorgeous to behold, it still contains the baptismal fount in which Wolfgang Amadeus Mozart was baptized! After touring the cathedrals, we decided to go grab dinner. For this show, we had opted to attend the show only instead of paying for the dinner. The show alone was $26 Euros while the show with dinner was $42 Euros. Mom and I decided we could choose our own food for less than $16 Euros apiece. As it was, we stumbled across an amazing restaurant simply called Cafe-Restaurant. 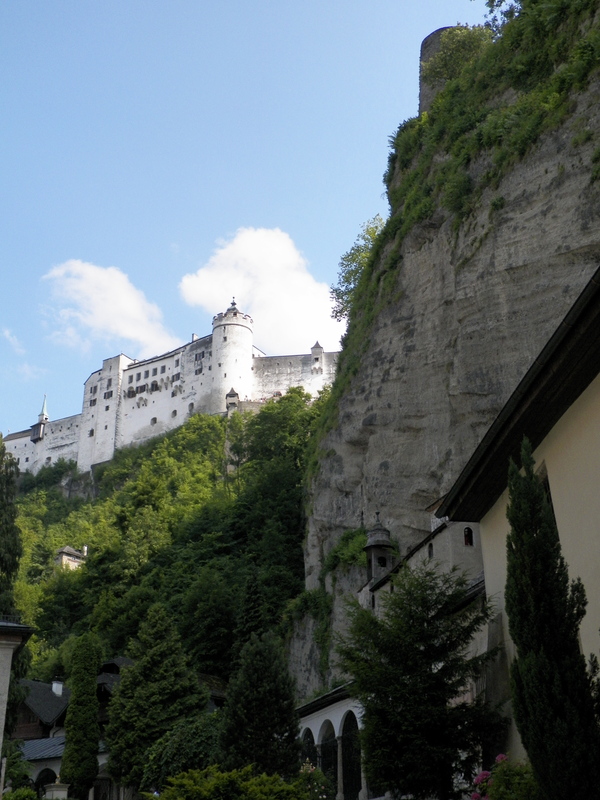 It served excellent food at a cheap price, and it’s claim to fame is its view of the Salzburg fortress. Guests get to dine while looking at this amazing piece of history. We choose the seat in the corner (a local artist’s favorite spot, he confided), and enjoyed an amazing dinner and dessert for just over $16 Euros for the two of us. 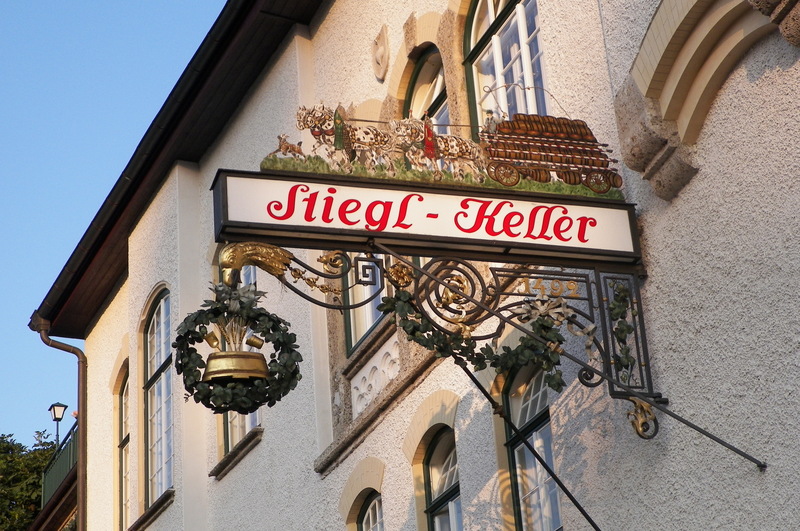 We went to Steigl-Keller to get our tickets, and still had about an hour to wait, so we headed down to Nonnberg Abbey. 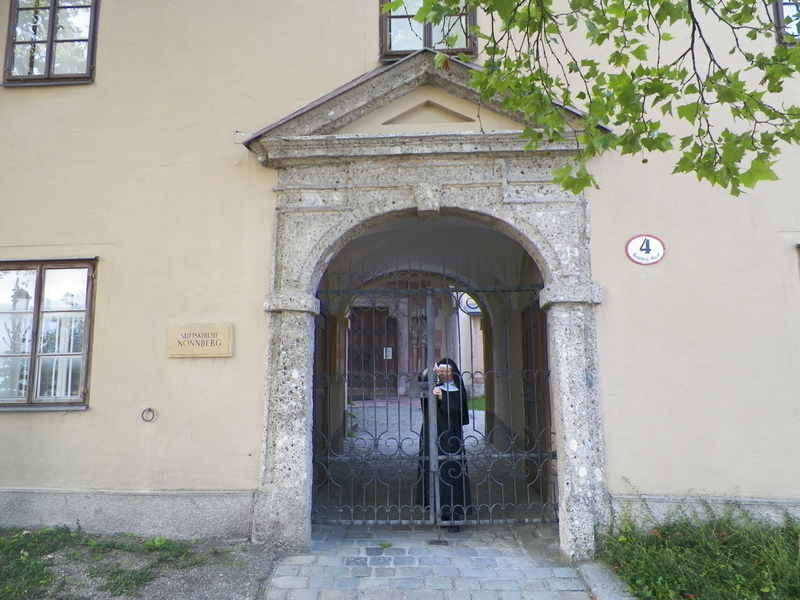 You may or may not know that Nonnberg Abbey is the Abbey Maria von Trapp attended and was used in the Sound of Music. As a special gift from God, we arrived just in time to be at the gates when the nun came to lock up. Between that moment, the police sirens we heard, and the sound of the carillon, it was an incredible surreal moment. Finally, it was time for our show to begin. The Sound of Salzburg features 4 performers who are classically trained at the Mozart music school. Their program started with footage of the real Maria von Trapp discussing various aspects of her life. My favorite was the story of her engagement. Apparently, it was the von Trapp children who decided their father should marry Maria so she would never leave. When they informed him he should marry her, he responded, “I don’t even know if she likes me.” They promptly went to ask Maria if she liked their papa. Well, what do you say to that kind of question? She said, “Of course I do.” When they informed Captain von Trapp, he apparently considered their engagement settled, since later that evening, he came into the library where Maria was cleaning, and told her that was sweet of her. When she asked what he was talking about, he mentioned their engagement. She promptly dropped the expensive vase she was cleaning, which shattered on the floor, and ran to the Abbey. Discussing the situation with the Reverend Mother, who then spent some time in prayer with the other nuns, Maria was informed that it seemed to be God’s will for her to leave and marry Captain von Trapp. She was crushed. To her, it felt like they were kicking her out. By this time, it was later in the evening, so Maria had hoped to get back into the von Trapp house without waking anyone, but she saw the library light on and knew the captain was still awake. He greeted her at the door, saying, “And…?” to which she promptly burst into tears and said, “They say I have to marry you!” And the rest is history!